Relax on a shady haybale and watch riotous stage plays and hilarious comedy acts on multiple stages throughout the village. 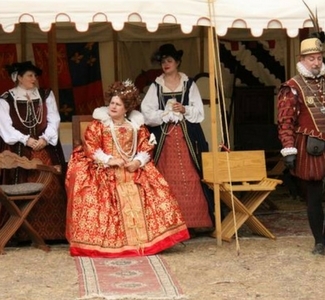 See authentic Elizabethan dancing, plays, singing, a falconry show, juggling acts and buffoonery. Treat your taste buds to a bounty of delicious foods and the finest ales, beer and wine while being entertained by musicians, rogues and dancers.